Collagen is skin’s major component. It resides in the dermis and has a fibrous structure, rather like felt. When we lose collagen, our skin loses its firmness, its “bounce,” and becomes brittle and flimsy. Some people turn to beauticians who try to restore that facial collagen through creams, masks or injections. None of it works well. Healthy collagen fibers have a strong affinity for water. With age, they lose their hydrophilic properties. As a result, collagen fibers become hard, unable to keep moisturizing the skin. The channels that run between the collagen fibers become obstructed, and consequently the capillaries can no longer use them to send nutrients to the skin surface. Wrinkles appear. I want to share with you how to prevent or eliminate wrinkles, even if you are over 60, as I am. Cupping massage is one of my secrets. Cupping massage works by “fluffing” the collagen fibers. Cupping therapy strongly enhances capillary blood flow, even in places where it’s been stagnant. When using the “cupping massage” method, your aim is to exert a repetitive, mild stress to the area you’re massaging. During cupping, pressure differential makes blood and lymph rush to the surface from underlying tissues. Improved circulation rejuvenates the capillaries. Watch the video below, where I demonstrate facial cupping on myself. Regular practice will keep your skin nutrient-rich and well-hydrated, oxygenated and free of trapped toxins - all of which will show glowingly through smooth, moist skin. Many of us are afraid of loose skin but cupping actually tightens it. 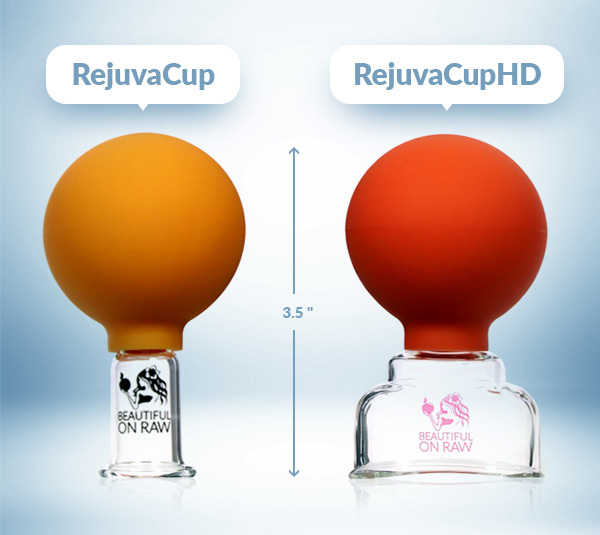 We offer two cups now: my original RejuvaCup, and my new RejuvaCup HD (High Definition). The original RejuvaCup is for beginners. My new RejuvaCup HD is much stronger. It has a bigger mouth and a curved rim, so it hugs the face tightly and assures a smooth glide across your skin. If your face is new to cupping, you definitely want to start gently with our original RejuvaCup. This allows your facial skin to adjust to this kind of massage. Then, in six to eight weeks, try our new RejuvaCup HD. RejuvaCup HD provides an advanced level of facial cupping for more experienced users. 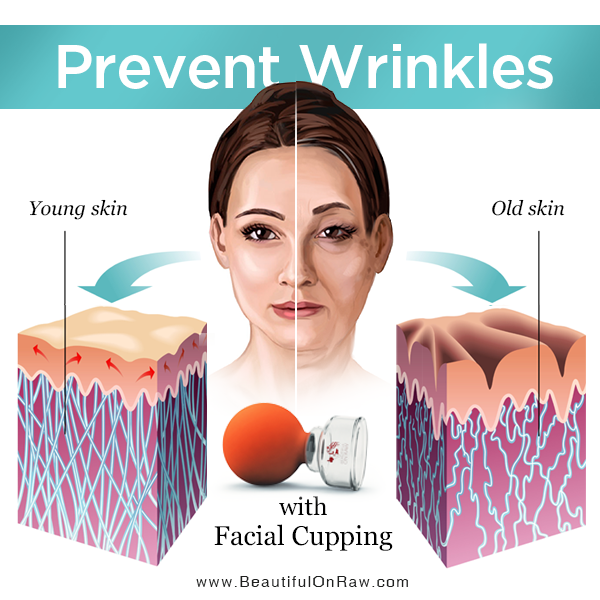 It's meant for people who have been regularly using RejuvaCup for at least six to eight weeks and who feel ready to apply an increased suction for facial cupping. 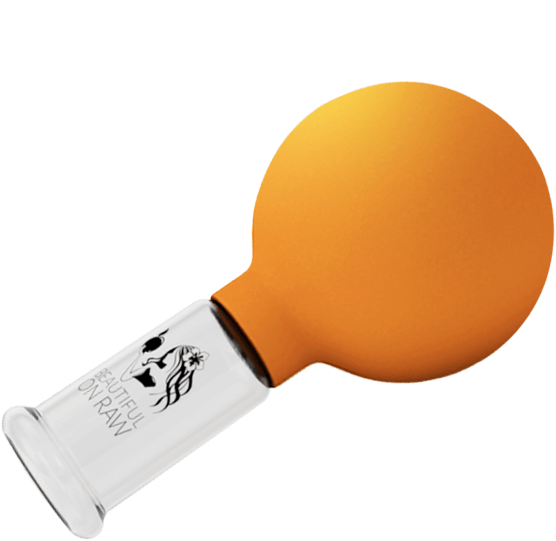 RejuvaCup HD offers superb suction for extraordinarily facial glow! Now, some of my customers have asked me if they can use the smallest cup from the Venus Body Sculpting Set for their face. I always said No. Venus Body Sculpting Set is for the body only. Why? Because if you try the smallest cup from that set on unprepared skin, it may lead to some unpredictable consequences, just as you can injure yourself trying to pump too much weight too quickly. You should begin with the appropriate suction when you first attempt facial cupping. Understand: You are training your skin. Just as, in a gym, you’re training your muscles. You wouldn’t try to lift the heavy iron before you were comfortable with the lighter weights, would you? Same here, with the skin. In my own use of RejuvaCup, I noticed the following: My skin had become so accustomed to the level of suction from the RejuvaCup, that I stopped feeling the very thing I used it for—that warm, pleasing flush on my face. Eventually I did try the smallest cup from the Venus Set. Much stronger suction. Indeed, I felt the cup’s mouth had to be widened to make up for that seriously increased suction. That bigger mouth called for a curved rim, so it would hug the face more tightly and glide more smoothly. That’s how RejuvaCup HD was developed. It took the creation of four different molds and testing samples before I found a shape that was satisfactory. Using the stronger suction, I tested the product for months to ensure there were no negative consequences. The good news: There were none! And my skin is better than ever. Here’s how to use it: Remove all makeup from your face. Apply some oily cream; I use my night cream. Begin the cupping massage. The stronger the cup, the more intense the experience, so you’ll want to work up gradually to the high-definition experience the RejuvaCup HD can give you. WARNING: Substantial experience with RejuvaCup is strongly recommended as a prerequisite. RejuvaCup accomplishes basic skin preparation—vital for you to move to deeper, stronger stimulation with RejuvaCup HD. You should still use our original RejuvaCup for your under-eye area and your forehead. Follow all directions, please—your skincare must be smart. RejuvaCup and RejuvaCup HD is your best facial cupping set. But let’s get real. When it comes to your health and beauty, be wise. This is not an area to do something spontaneous. Honestly evaluate the condition of your skin and understand that RejuvaCup HD is NOT for beginners. If you’ve never performed facial cupping massage before, the original RejuvaCup is the place to start. Don’t try the RejuvaCup HD until your face gets totally accustomed to the RejuvaCup. Everything about skincare must be done gradually, allowing appropriate time for your skin to progress from one level to the next. Cupping massage is very benefitial for your face and for your body. Read Cupping Massage for Beautiful Skin. For your body cupping massage try our Venus Body Sculping Cups!